Here at A2X, safety and effectiveness are our primary concerns in providing a natural formula that works for you. That’s why A2X has been carefully formulated using natural ingredients with the highest safety ratings and highest levels of effectiveness according to scientific studies. But it’s not enough to simply combine the safest and most effective herbs into a formula. Just as you can buy fresh fruits or vegetables from a farmer’s market that is much higher quality than at your local supermarket, not all natural herbs are created equal. There are many different suppliers of the same herbs around the world, but the purity and potency of the ingredients is not always the same. For this reason, A2X is comprised of only the highest quality natural herbs that are held to the strictest standards of safety and effectiveness. 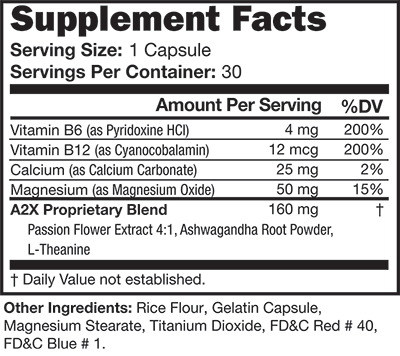 Here we have provided the Supplement Facts label that can be found on every bottle of A2X, as well as an in-depth description of each ingredient contained in our formula. Passion Flower Extract 4:1 Passion flower has a long history of use by Native American healers for its calming properties. Its powerful ability to promote relaxation and help overcome insomnia led to its adoption by European settlers in North America. Passion flower continues to be used in holistic and alternative medicine today. In a 2001 study, its effectiveness in the treatment of generalized anxiety disorder was compared to oxazepam, a prescription anxiety medication. The study found that passion flower performed as well as oxazepam in reducing anxiety symptoms and produced fewer side-effects. Ashwagandha Root Power The root of the ashwagandha plant has been used for centuries in traditional Ayurvedic medicine for its ability to relieve psychological and physiological stress. Its use has continued to this day, and several recent studies have confirmed the long-standing reputation of ashwagandha as a natural anxiety reliever. One study showed that ashwagandha root improved mental health, concentration, and overall vitality more than psychotherapy. L-Theanine 98.5% Green tea has been consumed for centuries in Japanese culture as a natural relaxant. Scientific research in the 1950s linked the calming properties of green tea to l-theanine, an amino acid that occurs naturally in the green tea leaf. Research into l-theanine has revealed that it can raise the levels of serotonin, dopamine, and GABA in the brain, which collectively reduces the body’s stress response to anxiety-inducing stimuli. Vitamin B6 (as Pyridoxine HCl) A recent study has shown that Vitamin B6 is a cofactor in the tryptophan-serotonin pathway. As a result, low levels of Vitamin B6 in the body can cause a reduction in the production of serotonin, which subsequently raises anxiety levels. For this reason, ensuring that your body has plenty of Vitamin B6 can be essential in fighting anxiety. Vitamin B12 (as Cyanocobalamin) Recent studies have shown that low levels of Vitamin B12 have been linked with depression, sleep disorders, fatigue, and dementia. Improvement in the level of Vitamin B12 has also been demonstrated to improve instances of postpartum depression. As a result, taking Vitamin B12 can be a key consideration in helping to overcome feelings of stress and anxiety. Magnesium (as Magnesium Oxide) Modern soils are often depleted of many natural minerals that were present in the diets of our ancestors. One of these minerals is magnesium, which plays an essential role in biochemical reactions throughout the body. In this way, magnesium deficiency has been linked with anxiety and insomnia. Research has shown that a daily magnesium regimen can help counteract heightened stress levels. Calcium (as Calcium Carbonate) Calcium plays a key role in healthy brain function, along with many other essential processes in the body. Research has suggested that calcium deficiency is linked with irritability and heightened stress levels. However, increasing your calcium intake through supplementation can help to counteract the unpleasant side effects of calcium deficiency. Rice Flour While rice flour is not an active ingredient in the A2X formula, it is mixed with the natural ingredients inside the capsule. Rice flour is not just used to fill up the capsule. Rather, its highly absorbent qualities make it a critical part of the capsule delivery system, as it ensures that any wet or oily ingredients do not leak out of the capsule. It also helps to make sure that each and every pill has exactly the right amount of natural ingredients inside. Rice flour is used instead of other flours because rice is not a common allergen. Other Ingredients The remaining ingredients listed on the Supplement Facts label comprise the gelatin capsule to deliver the A2X formula in a compact and easy-to-consume form. Gelatin, magnesium stearate, and titanium dioxide are three common ingredients found in small amounts in many prescription and over-the-counter medications delivered in tablet or capsule form. Similarly, small amounts of FD&C Red #40 and FD&C Blue #1 are used in small amounts to color capsules and food products.